Char Goldbach recounted leaving school early one semester because she could not get proper health care for her depression. 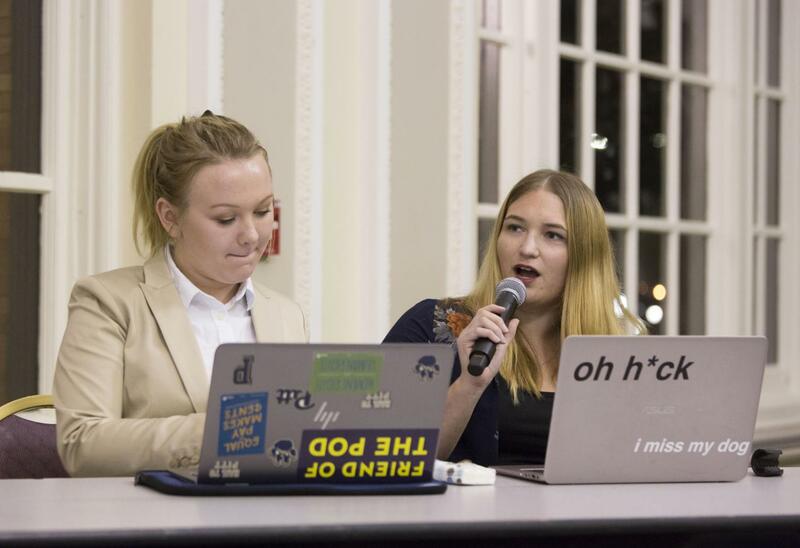 Goldbach, a senior majoring in political science and communication, represented the Pitt Democrats opposite the Pitt Libertarians at the Healthcare Debate hosted by Pitt Health Occupations Students of America Monday night in the William Pitt Union. Pranav Murthy, president of Pitt HOSA and a junior majoring in biology and economics, said the debate was a follow-up to an event last year, regarding President Donald Trump’s policies on universal health care, to see how views have changed since his inauguration. The event started with the presentation of the debate’s resolution, “The United States government should ensure that all Americans receive adequate health care,” followed by the Pitt Democrats’ affirmation and the Pitt Libertarians’ repudiation of the resolution. The Pitt Democrats then presented their argument for universal health care. Grace Dubois, a first year majoring in political science and biology also representing the Pitt Democrats, began her side’s case by describing how adequate health care is a human right and how patients are victims of the current system. Dubois also illustrated the economic benefits of adopting a universal health care system and the need to prioritize human life over profit. In the Libertarians’ cross-examination of the Democrats’ argument, Cameron Hallihan, a sophomore majoring in neuroscience representing the Libertarians, criticized the plan to fund a universal health care system’s model. Hallihan went on to illustrate other countries’ universal health care systems’ inability to provide quality care compared to America’s free market system. He cited insufficient supplies and the United States’ pre-existing low hospital death rate as reasons to avoid universal health care. Hallihan also portrayed the hardships of funding universal health care. After cross-examining the Libertarians’ argument, the Democrats entered into their rebuttal and emphasized the government’s responsibility to provide for the American people’s health. Goldbach explained how her firsthand experience made her realize the wait time for receiving care can seem like forever. Dubois also pointed out how, though most Americans favor universal health care, companies are prioritized over individuals. The debate ended with the Libertarians’ rebuttal. Phil Saggese, a sophomore political science major, said people from countries with universal health care often seek better care in the U.S.
“In Canada, we see 50,000 people crossing the border to seek healthcare in America,” said Saggese. “When you have to choose in government healthcare, you only get tow of the three things you really need” — low prices, quality and accessibility. Following the Libertarians’ rebuttal, audience members were permitted to ask the debaters questions. One audience member asked the Libertarians about whether health care should be considered a right. Saggese responded that the free market, not the government, is best at giving everyone quality health care. Andrew Liu, a senior majoring in biology and anthropology who attended the event, said the debate reminded him of the entertaining debates he was part of in high school. He said the debate didn’t sway his thoughts, though. No winner was picked for the debate, but Murthy thinks it’s better that way. Correction: In a previous version of this story, The Pitt News misquoted and misrepresented Phil Saggese’s rebuttal. The story has been corrected. The Pitt News regrets this error.